The evolution of human phonation is thought to have contributed to the rise of our species within the food chain. The ability to produce sound created more complex forms of communication, such as language. Language is thought to be the key component to enhance our survival skills by increased depth of understanding within our peer groups. To understand the foundational element in what perhaps gave us an edge to survival, besides the acquisition and utilization of metacarpal 1, the process of phonation must be analyzed. Phonation is defined as a laryngeal motor behavior used for speech production, which involves a specialized coordination of laryngeal and respiratory neuromuscular control. To analyze the process of phonation, the anatomic structures and physiology must be considered. (Loucks et al, 2007). The larynx, also colloquially known as the voice box, is the main passageway to the lungs for functional aspects such as respiration, deglutination, and phonation. Our larynx is known to be a unique human specialization for speech because it is not present in non-human primates (Meshcheryakov, 2012). As seen in figure 1, the location of the anatomic structure is within the pharynx, behind the Adam’s apple and on top of the trachea. Figure 1. The location and anatomy of the larynx is shown above within the mid sagittal view on the left hand side of the photograph. 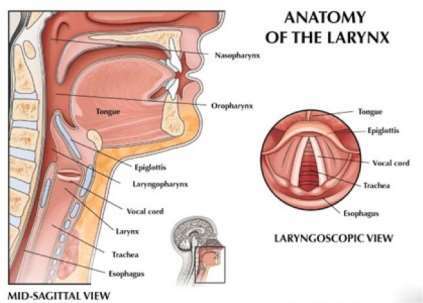 The laryngoscopic view of the larynx is shown on the right hand side. Retrieved from http://cvsurgicalgroup.com/general-ent/voice-swallowing-disorders/. Copyright 2017 by C/V ENT Surgical Group. Figure 2. Figure (a) shows the closed positioning of the vocal folds and glottis within the larynx. Figure (b) shows the open positioning of the vocal folds and open glottis. The location of the vestibular folds (false vocal cords) are identified within the image, though they do not contribute to voice production. However, vocal folds do contribute to voice production, hence their termed name of true vocal cords. Retrieved from http://howardyoung.info/lsitvkey-vestibular-folds.html. Copyright 2013 by Pearson Education Inc. Figure 3. The positioning of the vocal cords and rima glottidis is shown above during the common phases of respiration (normal and forced), phonation, and whispering. Retrieved from http://ueu.co/ovid-clinically-oriented-anatomy-8/. Copyright 2012 by Universities Education of Ukraine. Typically, the vocal folds within the larynx are open to allow air to pass freely in and out of the lungs during normal respiration. However, the signal to speak from the brain signals the muscles of the larynx to contract and close the vocal folds. Air during expiration is expelled from the lungs and the resistance overcomes the folds. The force initiates the folds to begin patterns of the vibrations. 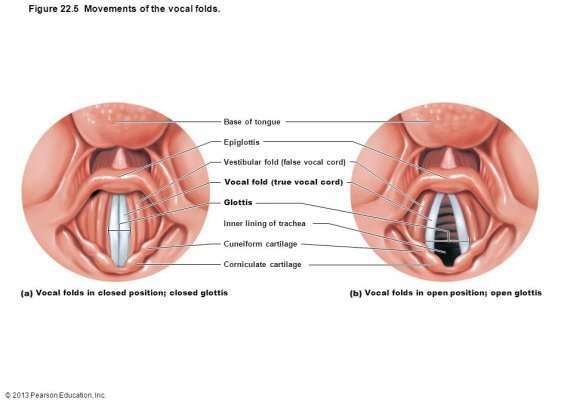 The rate in which the vocal folds open and close are different for the genders. The rate is another factor besides the length of the folds in which why the tones of the voices between genders are different. For women, the rate is typically between 100-120 times per second vs. in a man it would typically be 200-220 times per second. The patterns of vibrations of the vocal folds, in turn, produces sound waves from the voice box and projects them outwards towards another human. The sound waves from the larynx are amplified by traveling upwards through the anatomical structures of the throat, mouth, and nose. Depending on genetics of the shape, size, and muscle tension, everyone’s structures are built differently and usually affect the resulting sound another peer will hear from the human producing the sound. Other factors that play a role in the process of phonation would include the posture of the person and the relaxation of the muscles within the pharynx. (Bailly et al, 2014). Titze IR. Principles of Voice Production. Englewood Cliffs, N.J.: Prentice Hall; 1994. "The Process of Phonation." UKEssays.com. 11 2018. All Answers Ltd. 04 2019 <https://www.ukessays.com/essays/sciences/process-phonation-8845.php?vref=1>. "The Process of Phonation." All Answers Ltd. ukessays.com, November 2018. Web. 20 April 2019. <https://www.ukessays.com/essays/sciences/process-phonation-8845.php?vref=1>. UKEssays. November 2018. The Process of Phonation. [online]. Available from: https://www.ukessays.com/essays/sciences/process-phonation-8845.php?vref=1 [Accessed 20 April 2019]. UKEssays. The Process of Phonation [Internet]. November 2018. [Accessed 20 April 2019]; Available from: https://www.ukessays.com/essays/sciences/process-phonation-8845.php?vref=1.